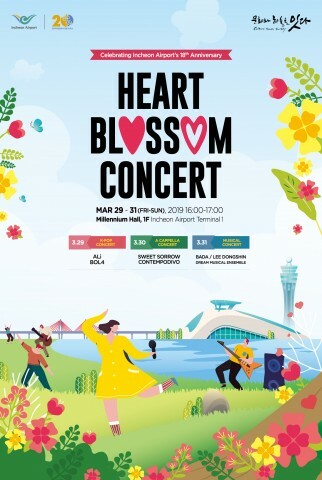 Incheon International Airport hosts HEART BLOSSOM CONCERT featuring top artists in Korea from March 29 to 31 at Millennium Hall to celebrate 18th anniversary of Incheon Airport Terminal 1. INCHEON--(Korea Newswire) March 28, 2019 -- Incheon International Airport will host ‘HEART BLOSSOM CONCERT’ featuring top artists in Korea from March 29 to 31 to celebrate 18th anniversary of Incheon Airport Terminal 1. The concert will be held from March 29 to 31, for one hour beginning at 4:00 PM each day, at Millennium Hall located on the first floor of Incheon Airport Terminal 1. The performances are free of charge for all airport visitors, and seat reservation is also available on Incheon Airport Culture-Port website (www.cultureport.kr), on a first-come-first-served basis. For details, visit the website or call Terminal 1 Culture and Art Secretariat (+82-32-741-2247).